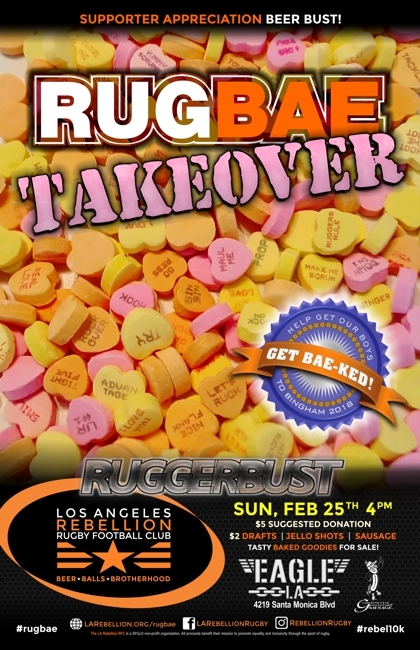 Our RugBAE booster squad is taking over this February's Ruggerbust and we're inviting you to come "Get BAE-Ked" with us in support of the team's journey to the 2018 Bingham Cup in Amsterdam. We'll have delicious homemade and locally-made desserts for sale, along with Coors Light draft beer, extra strong jello shots and sausages from Continental Gourmet Sausage. All proceeds benefit our #Rebel10K campaign to raise $10,000 for the 10,000 miles we're traveling to promote equality and inclusivity on and off the pitch. Interested in joining the RugBAE Squad? Learn more about our supporter memberships and make your donation today!